We talk about it all the time…Retailers rushing the season. In July you can’t find a swimsuit because the store is preparing for Back-to-School. September brings on Halloween and prior to Halloween, the halls are being decked for Christmas. This used to upset me. I love Thanksgiving. I think it might be my favorite holiday. Focusing on our thankfulness, spending time with my family and eating stuffing all rank very high on my pleasure scale. I love the colors of Autumn, the decorations in green, orange and red, the pumpkins & gourds. The scent of cinnamon and pumpkin candles and the chill of a fall evening to light them also bring me joy. My house has beautiful leaves inside and out. Previously, I felt like people weren’t appreciating the holiday by giving it the attention it deserved. They were blowing past it to hit Christmas hard and heavy before the end of November. I resisted. I kept my pumpkins out and refused to get out the tinsel until December 1. Who wants that stuff sitting around for weeks anyhow? Well, this year it appears to be me. Although the fall decorations and scarecrows are still on display, I must admit that my head and heart are heading swiftly to Christmas. If I don’t start now, I’m afraid I’ll wake up in 2016 not having enjoyed the holidayS to their fullest. 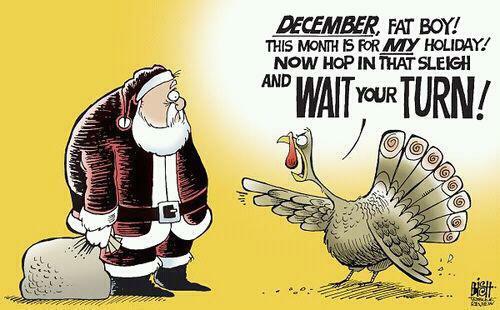 On this November day, I am pledging to focus on both Thanksgiving and Christmas at the same time. The boxes of Holly and Ivy will stay in the basement until the day after I eat turkey, but they are already dusted off and open. While I am enjoying family at Thanksgiving dinner, I’m going to be VERY thankful that I only have to wait a month to be with them again. I will be thankful that as we dine on leftovers, some of the family will remain and will help me find the perfect place for our animated Bing Crosby and our Jingle Bell marching band to call home for the month of December. Just as we don’t choose only one day to celebrate the gifts of our friendships, families and relations, I don’t think we should limit our Thanksgiving or Jesus’ Birthday to one day. Whether you can tell by the lights and decorations in our homes or not, let’s be thankful & recognize the importance of the birth of our Lord daily. Oh, and Happy New Year!